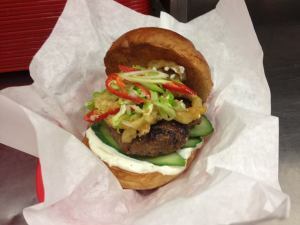 Skinny’s Thai beef burger: the name may be Skinny’s but the burgers are fat. We don’t know whether it’s because the economy is looking up or because someone has dropped something into the water but Glasgow has gone loco for new openings in the last couple of weeks. The long awaited Hard Rock Cafe opened on Buchanan Street in Glasgow yesterday. Look out for mighty fine AC/DC memorabilia; splendid burgers and stellar service. As we forecast a few weeks back, Skinny’s has opened on Otago Street. The former Crabbie Macs site is now a burger, cocktail and breakfast joint. Burgers headline the food menu alongside ‘wings ‘n’ tings’, assorted fries and a range of sundaes. On Sauchiehall Street, things have all gone a little Mexican with the launch of Juan Chihuahua. Billed as a Mexican cantina and tequileria, the kitchen rolls out all the tacos, fajitas and enchiladas that you might expect but also adds in ceviche, slow cooked ribs and a nifty looking mango salad. There are some fifty odd tequilas behind the bar – an interesting development for anyone who has moved beyond knocking the stuff back with a lick of salt and bite of lime. Meanwhile, in the West End, The Butterfly and The Pig on Bath Street have opened a second branch on Partick Bridge Street in the West End. Mismatched vintage crockery and hearty, traditional dishes such as gammon steak with pineapple are the draw. 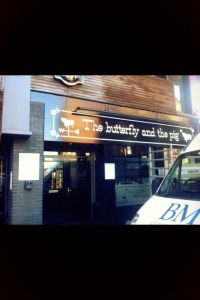 The Butterfly and The Pig have fluttered to the West End with a second venue.